It’s been a hectic 3-day marathon but we’ve completed our 3D tower defense game, Blocky Hill! I made the random map generator. Since there are towers that are placed on the sides of blocks as well as on top, it’s important to have plenty of hills to place all kinds of towers, but not to have deep valleys because it blocks the camera. Perlin noise worked great here: it makes these nice smooth hills. Every Ludum Dare, I look in awe at folks who are able to implement procedural generation in their games. It’s never anything I’ve really tried before, and just about every compo ends with me making a mad dash to design levels that are never as balanced or fully-featured as I’d like. Now to get the enemies that I already have developed also being slotted on the level, and I’ll be well on my way to an actual game. Just wrapped up my game called “Aquila”. Aquila (also known as a constellation in the northern sky) is a top down arcade game. You play as an ancient soul who is trying to escape from the ruins. The level is generated dynamically as the player moves from tile-to-tile. I think may be I can call this “Procedural Generation”, as there is no randomness involved. The goal of the game is to reach the end tile while avoiding or killing enemies. You can also collect some ancient artifacts as an added bonus by destroying the ruins. 2) Since the level is dynamically generated, so you only get one “unique” level per play session. PS: I will write a detailed post-mortem about this jam later. Need to rest and sleep and eat and … .. .
I’ve been playing around with different ways to fake the atmosphere of a planet in a 2D canvas context. That’s interactive, by the way, so mess around with it (Chrome/Chromium is recommended!). Clicking on/around the planet changes the “angle” of light. You can get some pretty nifty looking results. I made this to determine what were reasonable parameter-ranges to use to generate plausible-looking planets. 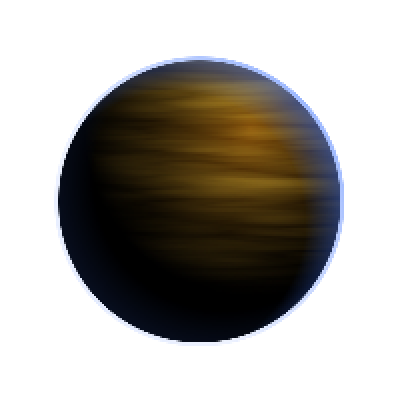 The way I get the sort of “volumetric” look for the atmosphere is really simple: I just stack many semi-opaque layers of the same gradient-filled-circle over the planet, each one having a radius slightly bigger than the previous. I actually threw this together using with a JSFiddle which you can view/hack here. Of course, I still need to figure out how to combine this with a surface/cloud texture (procedurally generated or otherwise…). The compo is over, my game is finished and the rating starts. For anyone trying out my game (if you haven’t yet: HERE), I will explain some strategies to survive, just in case you have trouble with it. Additionally, as I tried to get some advice from my wife for setting up the level generator yesterday evening she wasn’t really enthusiastic, to say the least. So for anyone more interested in the tech behind I will explain, why the level generator currently doesn’t work that good for providing difficulty. The game mechanic basically works with to values that decrease as long as you are digging tunnels (and even when passing existing ones). The first value is food/hunger. You can find three different kind of food which will give you 5 to 15 points back. Food, if there is any, is only revealed if you enter a cage. By that, it is often necessary to leave the direct path and search adjacent rooms if you are low on food. This strategy also has a second benefit related to the second value, hope. Hope is generated by spotting new cages around you. So progressing the level is the key to prevent death by starvation. The hope mechanics leads to another point. Often it is better to move to the center of the level because chances for revealing cages is better in free field than at the level borders. This seems contradictory to the aim of getting to the upmost row or the rightmost column which are the only places to escape the level later on. Remeber that you can see 2 spaces horizontally and vertically and one space diagonally (not if you are digging). So if you already are two rows below the top border and there is no cage above, you won’t find any if you dig that direction. The cacti walls are revealed by digging, so sometimes a tunnel can give further information for planning your path. This only applies if you have enough food/hope left. Headed to the center and didn't took the direct path to replenish food and hope. Else I would have died short before exit (Difficulty: Hard). With that you should be able to beat all difficulties after some tryouts. At this point the random generator sets in. The design I used is rather insecure in providing the difficulty level. Instead of spreading a fixed amount of cages for each difficulty, I implemented to check a percentage to set a cage for every field of the grid (e.g. 33:67 that there is a cage on a field in normal mode). Instead of filling one third of the level with cages, this leads to very unsteady number of cages. By that, an “insane” level could have more cages than an “easy” one. Same applies to walls. By that the difficulty selector is a rather vague adjuster. But nevertheless you will notice the difference if you give it some tries (one playthrough is quick; around 15 seconds). So go and play. Good luck. Just a game design related teaser for the post mortem coming soon. I now have cities and roads, albeit the roads are not very natural. They feel sort of alien. Also, the cities doesn’t have names or populations yet. Too be honest, I could probably spend the rest of the weekend on making the roads good, so I will probably try to get on with the rest of the game stuff instead, since the game doesn’t actually need perfect roads. Just roads. Next I should get some factories and stuff out there. I’ve finally done something that’s visible, the land type map generation, though it doesn’t look much like a map yet, it will need cities and roads and stuff as well. Other than that, I’ve just written down kinds of resources, factories, trucks etc, and their costs. In all honesty, the base of the heightmap (the noise cloud generation) is almost identical to the one I wrote for The Hat Swarm Attack on Dance Islands. But on top of that, there’s some erosion code and texture maps. Also, there’s mesh creation, but you don’t see that above. Well, I’ve come to the conclusion that I don’t have a clue what I’m doing when it comes to procedural generation. I should have had this done much sooner, but I’ve finally reached the stage where I have something which could be described as procedural dungeon generation. # # # # # # # # # # # # # # # # . . . . . . . X . . . .
25 queries executed in 0.125 seconds.